Throughout my life, my mom has told me that worrying about it will not solve the problem nor make it go away either. And while I agree and understand what she is saying, there are times in my life that I haven't been able to stop worrying about the 'What ifs' when it comes to my health. As many of you have read in my past posts, there is uncertainty in my future when it comes to the idea of a transplant and for a long time my days were spent worrying and not enjoying life. It took me some time but I was finally able to pull myself back up and enjoy the time that I have now instead of worrying about the future. While I still plan and try to get my ducks in a row for the future, I don't spend my days in my room crying over my worries like I did when I first got the news about the hospitals not agreeing to do my transplant. 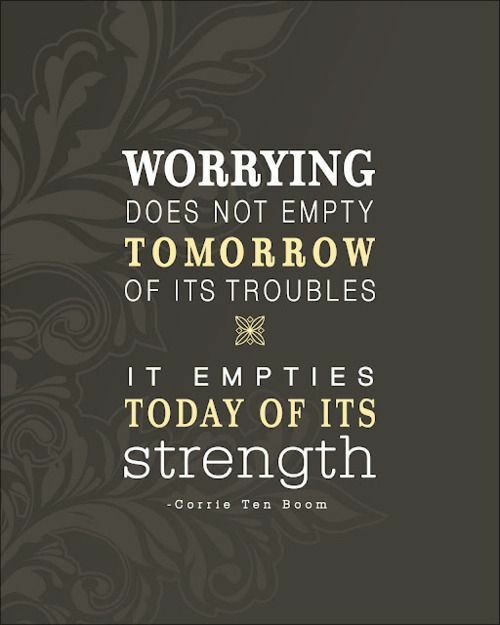 When it comes the topic of worrying and how it doesn't solve anything, I think this quote sums it up rather well. 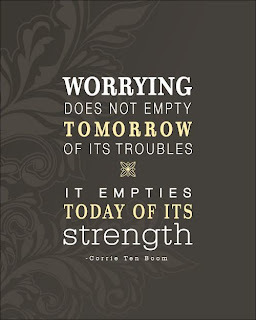 "Worrying does not empty tomorrow of its troubles. It empties today of its strength." - Corrie Ten Boom. When I would sit and let my worries consume me, I would cry until I was exhausted. I would lay in bed, not wanting to and not feeling strong enough to get up in the morning. While I wasted my days worrying and draining myself of strength, I was missing out on having some great days with wonderful memories. While we still haven't heard back from the hospital we sent my records to about whether or not they think they can do the transplant, I've slowly stopped worrying every second of every day and actually been enjoying the days I have now. It's not easy to do and to be honest, I don't think I made a choice to stop worrying because there are times when I still stop and worry. But I think as time went on, I slowly was able to continue with life instead of wasting it. Life goes on and I had to remind myself to do the same because what is the point of taking all my medications, doing all of those surgeries, not drinking caffeine and going to all the lengths we have to keep me alive if I'm just going to spend it worrying? So when I do finally hear back from the hospital and if I get some bad news - I'm going to have to remind myself of this quote and the next time you start to worrying, I recommend you read this quote a few times to help you through it.